"What had begun as a way to fit church in at home became a beautiful and meaningful family gathering. I can only hope that one day my children will get to experience 'home church' with their own kids." "Can We Do Church at Home?" This past September, I started a several-years-overdue sabbatical. Since I have three school-aged kids, my sabbatical was largely spent at home, interspersed with short retreats. Along with reading and prayer, I also enjoyed visiting other places of worship to see how people of faith worship God in different settings. Some of these church visits have been family-friendly, but others not as much. So on the days when I visited a church that might not be a good fit for them, my children suggested that we do 'family church' or 'home church' instead. It brought me back to my own childhood. My parents were shockingly consistent church-goers by today’s standards. But every once in a while my sister and I would convince them to stay home and let us plan a service for our family. We’d have readings and prayers and music and other more creative inclusions. I still remember finding those moments both meaningful and empowering. Maybe church leadership and faith weren’t only for adults! With 'home church' scheduled, my three kids worked together to decide on the order and substance of our service, and my 11-year old son created a handwritten program. Worship began after dinner, when each one of us were given a lighted candle. We sang “This Little Light of Mine” as we walked in the darkness toward our comfortable gathering place, snuggling together on couches around our candles. 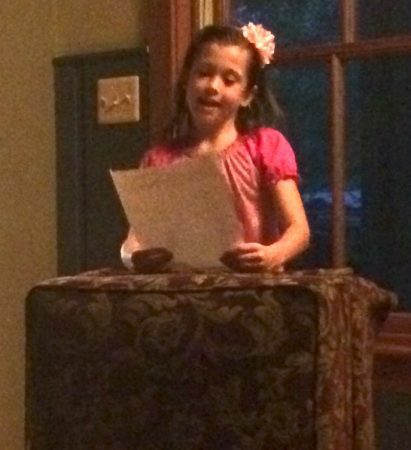 My 7-year old daughter Maya created a pulpit from an ottoman standing on its side, and she gave a 'sermon' about how God is in all things and so God was with us in that moment. She also retold the story of Noah’s Ark (one of her favorites), which brought smiles to our faces. They had asked me to re-tell the Gospel story for the day, so I paraphrased Jesus’ answer to the Pharisees when they asked him whether they should pay taxes to the emperor. Then we all shared a little about what in our life belonged to God (everything, we agreed), and what it would look like to more fully give that to God. My 14-year old daughter led us in sharing our highs, lows and God-moments from the week, a practice she learned at youth group. 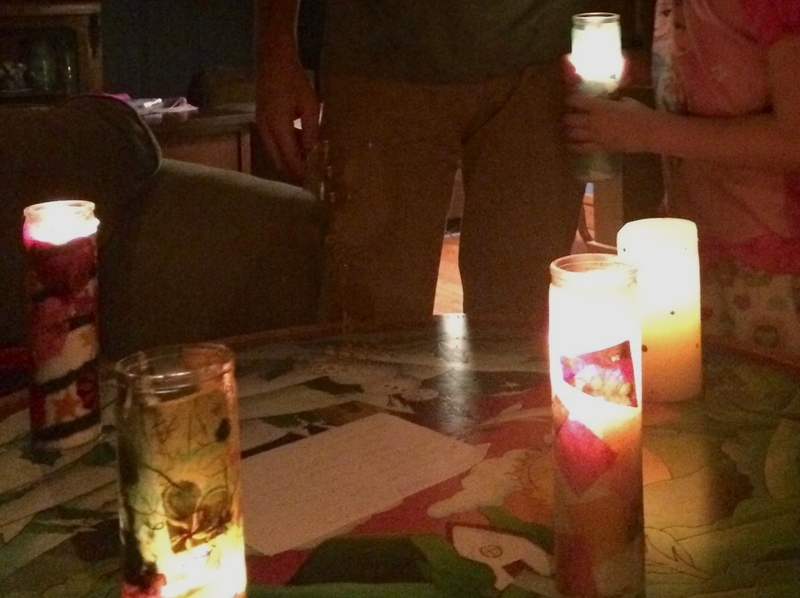 Everyone agreed that this candle-lit 'home church' was a God-moment, and for many of us, also a high for the week. 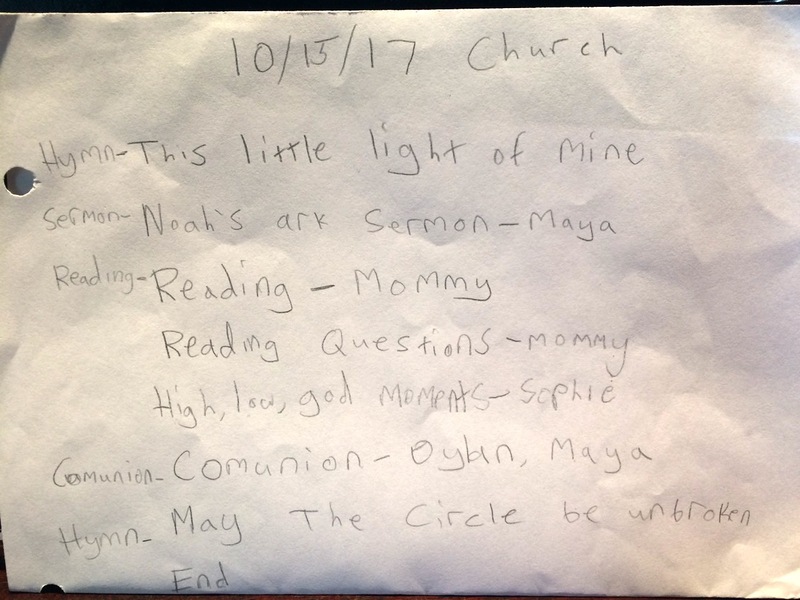 My son broke a piece of (raisin) bread and passed it around to share while we sang the chorus of “May the Circle be Unbroken.” No words were spoken about the bread, but for my kids who receive Communion in church, sharing bread felt like part of what we do as people of God, even if this wasn't exactly Eucharist. Finally we etched crosses of blessing on each other’s foreheads and each blew out a candle for a personal prayer intention. What had begun as a way to fit church in at home became a beautiful and meaningful family gathering. I can only hope that one day my children will get to experience 'home church' with their own kids. Here is the bulletin my son wrote up: As you can see, we kept it fairly simple. No seminary training required! As a priest, I hasten to add that as wonderful as our 'home church' was, I wouldn’t trade it for my family’s experience at St. Aidan's, our own church community. At St. Aidan’s (where I am the Associate Rector) my three children know they are welcomed, loved, and supported by an incredible intergenerational parish. They are involved in worship, Sunday school, youth group, plus community outreach and social justice opportunities that aren't often available for young people. At church, my children also have a place where – unlike most of the rest of the world – they are not judged on looks or success or grades or popularity. This is so valuable. Actually, I’m betting their positive experience of church is what made them excited about trying church at home. As for me, 'home church' was a tangible reminder that liturgy really is the work of the people; and that professionally trained/ordained ministers (like me) are not the only ones who create holy space in our midst. Elizabeth Rees is the associate rector at St. Aidan’s Episcopal Church in Alexandria, VA and part of the creation team for the Center for Spiritual Deepening at St. Aidan’s. She has three young children (7, 11, and 14) and is always looking for ways to make church and spirituality more welcoming and relevant to kids and their families. You can read more of her work at reverendelizabeth.blogspot.com.